GB Group of Jewellery is a third generation family business established in 1961. With prominent outlets at the Gold Souk and Dubai’s Leading shopping mall, we offer a full range of gold and diamond precious semi precious, pearl, bullions jewellery with diamonds and other precious stones, including ruby, sapphire and emerald. 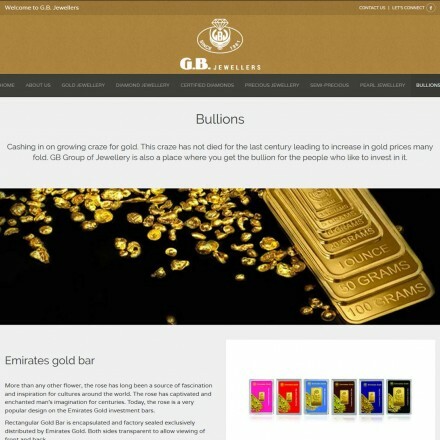 GB Jewellery are a long-established precious metals dealer, dealing principally in fine jewellery, but offering a selection of investment-grade bullion bars alongside their more ornate product lines. When doing business with GB Jewellers - please say you saw them in Bullion.Directory. Read or add GB Jewellers reviews and ratings using the "reviews" tab above. All GB Jewellers details are believed to be correct at the time of listing. Please report errors here.